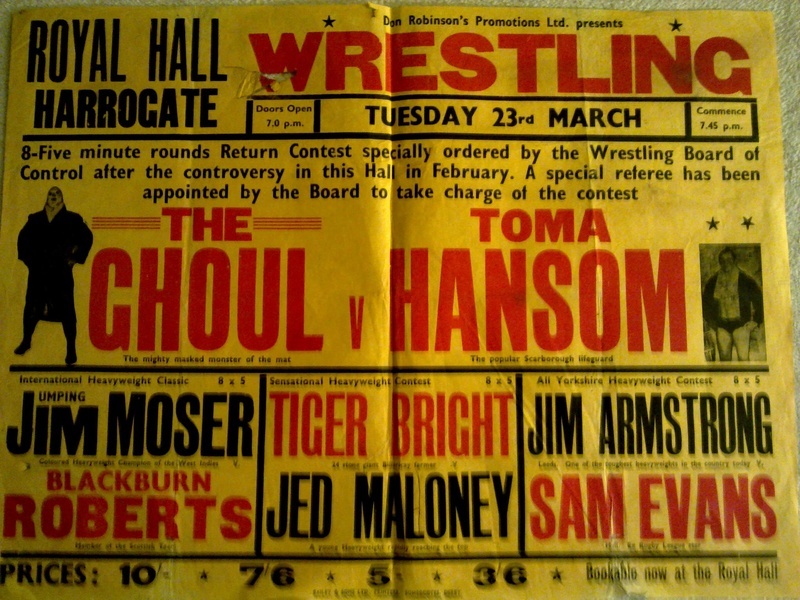 Toma Hansom, the Norwegian alter ego of Scarborough's Tommy Hanson is a name inextricably linked with wrestling promoter and entrepreneur Don Robinson. Don and Tommy were good friends before they entered the wrestling business, which they did together after approaching Darlington's Jim Stockdale one night at Northallerton Town Hall. Jim taught Don and Tommy the ins and outs of the professional style, and this was the start of a lifetime commitment to wrestling. Tommy turned professional in the early 1960s, many of his matches being on the bills of his friend and business colleague Don Robinson. Tommy would often manage Don's shows in the promoter's absence and was usually the man handing out the wage packets at the end of the night. During the 1960s Tommy worked around the country for all the top independent promoters: Don Robinson, Paul Lincoln, Cyril Knowles, Eric Taylor and Johnny Allan. He filled out into a mid heavyweight and could be seen in action against independent wrestlers such as Reg Ray, Spike O'Reilly, and the Klondyke brothers. Tommy's matches tended to be all action affairs, and not infrequently a bit of his blood would be spilled, none more so than in his clashes with the thirty stone heavyweight Klondyke Bill. Klondyke, like Tommy, also worked for Don Robinson in his non wrestling enterprises, and after Don had the idea of turning Klondyke into a wrestling attraction Tommy was entrusted with guiding him through many of those early matches. In the late 1970s Max Crabtree signed Tommy up for Joint Promotions, which allowed him his only television appearance, partnering Ray Steele against Mal Kirk and Ian Muir. A second recorded contest, a win over John Cox, was not broadcast. Tommy Hanson passed away on 13th March 2013.